This is a fantastic bike path/trail. And not only is this trail excellent, but it connects to the Clinton River Trail giving bikers, joggers, and walkers the opportunity to travel a very long distance if they wish. I highly recommend this bike path/trail. The West Bloomfield Trail starts at a parking lot off Arrowhead Road which is off Pontiac Trail heading East from Haggerty just before Orchard Lake Road. Just driving down Pontiac Trail and other area roads which border Orchard Lake is enjoyable. There are some amazing houses (estates) on this lake! The parking lot on Arrowhead Road and entrance to the Nature Preserve and Trail is very nice. 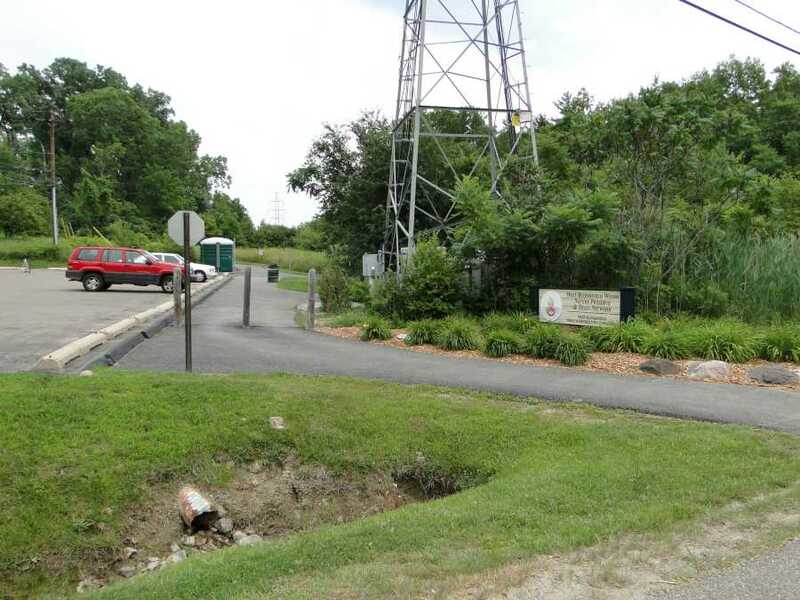 It has two, well-maintained and clean porta-potties and a gaazebo with information on both the preserve and trail. If you turn left at the gazebo you will be on the West Bloomfield Trail heading Northest. If you go straight from the gazebo you will be in the Nature Preserve. The trail actually had a path heading backwards, West, but it looked very much less maintained and unused (photo below). This path is not conisdered part of the trail. It heads in the opposite direction and clearly not being maintained like the actual trail. It does appears ridable and perhaps its in the works to develop it into a further extension of the trail heading West towards M-5. 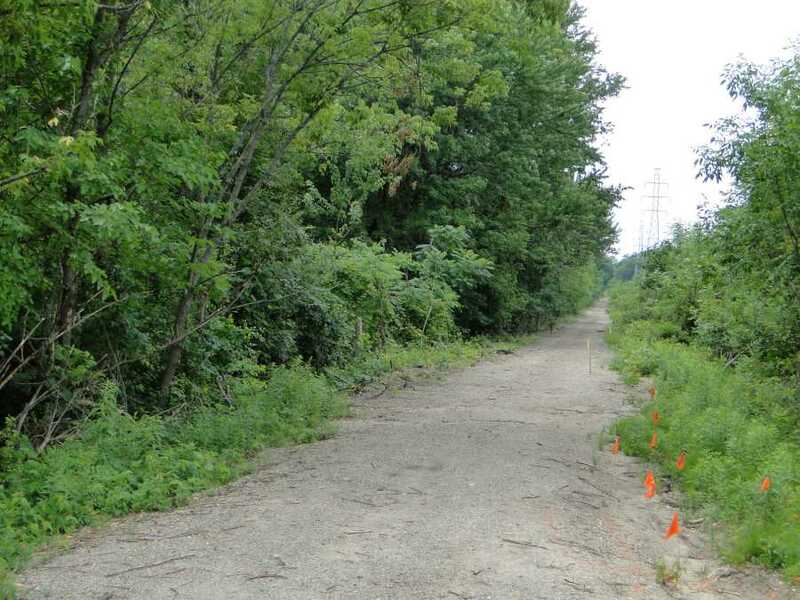 All of this trail used to be a railroad and if look at a Google Map you will see this undeveloped trail heads southwest through Halstead Road, then Haggerty, through M-5, and all of Walled Lake and Wixom until intersecting with radilroad trail going more North-South. This gazebo has many nice displays with information and history on the Nature Preserve and Trail. Go left for the West Bloomfield Trail. Go straight for the Nature Preserve. The nature preserve was a very nice, thick woods that follows the Trail a mile or so on its right. There are a few spots in the nature preserve where you can take a left on a path and move from the preserve to the trail. Technically, you are not supposed to be ride a bicycle in the nature preserve. The trails in nature preserve are pretty long - 2.5 miles - so you can really get a nice walk in there. They are also hilly. 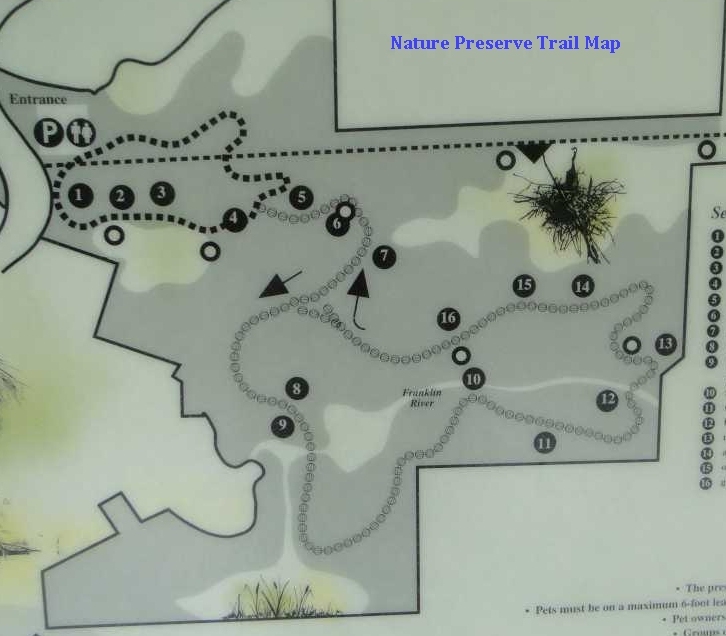 The total size of the nature preserve is 162 acres and can easily be mistaken for Northern Michigan right in the middle of West Bloomfield. Along the hard gravel packed trails in the nature preserve are information displays with information on the plant and wildlife in the preserve. There are also some very nice wooden observation platforms/overlooks to view marshes and westlands. The nature preserve is well-known for oak, hickory, dog woods, and black walnut trees, many 200 years old, as well as wildflowers, great blue herons, soaring turkey vultures, red-tailed hawks, osprey, woodpeckers, owls, 100 bird species, white-tail deer, red fox, coyote, mink, blue-spotted salamander, and weasels. "We might imagine something better, but it is impossible to produce it." THat's what one former owner said about the 162 acres that make today make up the West Bloomfield Woods Nature Preserve. Through the years, the nature preserve has captured the hearts and imaginations of many admireres. It also has had many owners who bought and sold its land or pieces of land. Several pioneers first laid claim to those woods during the 1830's. The first of these, William Richardson, grabbed up about 60 percent of the preserve's current acreage in 1832. Others such as Solomon Eagle (1853), H. Whitehead (1835), H. Wilson Morris (1836) and J. Morris (1838) claimed smaller peices of the woods. Morris lent his name to Morris Lake, located at the eastern edge of the preserve. They claimed the land, but didn't build on it or alter it. Evenutally, they sold their shares to others, including Willis Ward who acquired all the land in what is now the nature preserve. During the late 1800's and early 1900's, Ward and his family bought up several thousand acres of land, much of it lakefront property in West Bloomfield and Orchard Lake Village and sold it to people interested in building on or near West Bloomfield's many lakes. In a prospectus advertising the family's property to potential buyers, Ward set aside the woods as a community park. "In the many quiet nooks and dells in this reservation, which is largely forested," the prospectus says, "one may commune with nature undisturbed. An attractive feature of this park is a natural femery of several acres in the densest of forest shade." In calling the woods a reservation, Ward established a precedent that other generations would follow. The Ward family believed in preserving the woods for community, but they changed it in some ways. For instance, they created a system of bridle paths where residents rode horses 70 years ago, but are today used walkers and runnners. Horses are no longer permitted in the preserve. The Ward family also planted thousands of narcissus and other bulbs, plus hundreds of evergreen with the "object of lending a cheerful aspect to the countryside when the ground is covered with snow." Cross-country skiers whot travel the trails during winter know the "cheerful aspect" that these evergreen bring. The owners that followed the Ward family allowed it to continue to be free of development until the mid-1980's when it was described as "ripe for development." Urged by West Bloomfield residents, the West Bloomfield Parks and Recreation Commission stepped in. 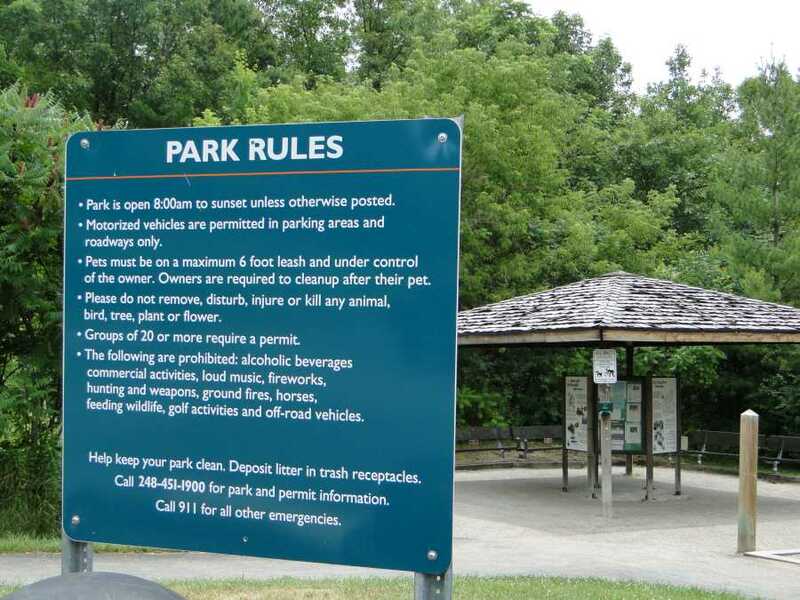 Utilizing its own millage money, plus a grant from the Michigan Department of Natural Resources Trust Fund, Parks and Recreation bought the woods in 1988 and 1989. In June of 1990, the National Institute of Urban Wildlife designated the West Bloomfield Woods Nature Preserve as an Urban Wildlife Sanctuary. It became the first nature preserve in the history of Michigan the receive such as distinction. The Rouge River, located in southeast Michigan, is more than 126 miles in length and more than 50 miles of it flows through public parkland, making it one of the most publicly accessible rivers in the state. A branch of the Rouge River, called the Franklin River, runs through the West Bloomfield Woods Nature Preserve and watershed. There are 12 species of frogs and toads in southeast Michigan. 8 of these have been confirmed in the Rouge River Watershed. A watershed is the area of land this is drained by a river system or by a network of river systems. 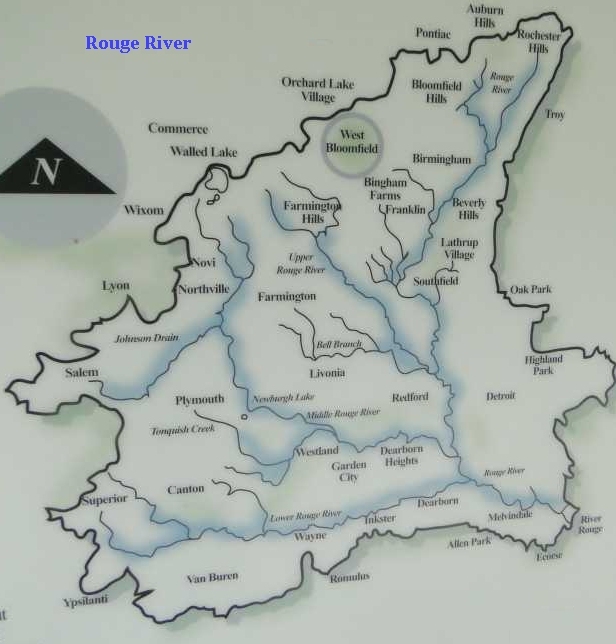 The Rouge River Watershed includes all of the land area and waterways that drain into the Rouge River. THe watershed is approximately 466 square miles and has more than 400 lakes and ponds. It runs through the most densely populated and urbanized land area in the state and includes all or part of 48 municipalities in three counties, with a population of over 1.5 million. From 1850 to 1940, sewer pipes were built to carry sweage and stormwater, which emptied directly into the Rouge River. Industrial wastes were buried or dumped in the most convenient location, which was often adjacent to or in the river. To protect public health and the environment, the Detroit Wastewater Treatment Plant was built in 1940. Numerous federal, state and location regulations have been implemented to protect water quality, but pollution still remains a threat. The West Bloomfield Trail is a fantastic, fine gravel, very level, smooth path for biking, walking, and jogging. It's very well kept up and used by very nice people and never overcrowded. You'll travel through beautiful tunnels of trees with views of various wetlands, ponds, and marshes as you go, as well upscale homes. At the first Orchard Lake Road crossing there are nearby restaurants and businesses. There are nice benches to rest at very frequenly along the path all with dedications to family memebrs. And there are several information and observation decks, one with an amazing long view of a gorgeous westland and a really nice free-to-use obversation telescope like you'd see at the Grand Canyon. 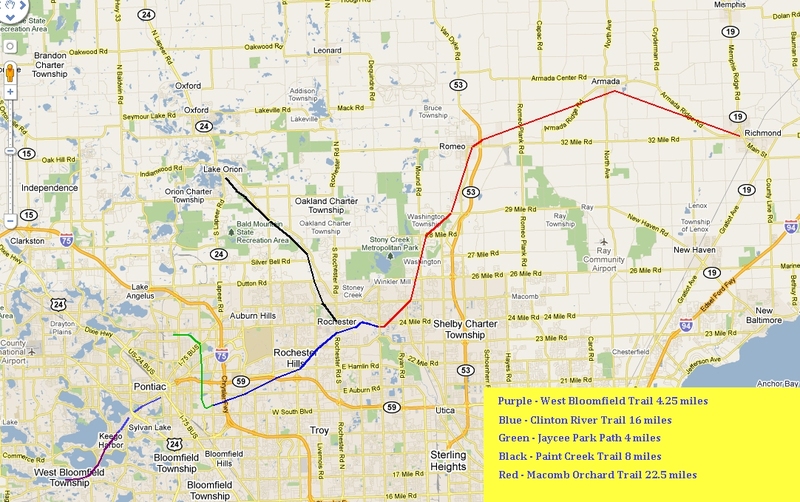 Click here for a large map showing how the West Bloomfield Trail turns into the Clinton River Trail and where the Macomb Orchard Trail and Paint Creek Trails come in as well. From 1896 to 1985, the West Bloomfield Trail was known as the Grand Trunk Western Railroad. During the 1870's, the Michigan Air Line Railroad built this corridor as a rail line through West Bloomfield. Michigan Air Line originally proposed that these tracks travel from Pontiac to Orchard Lake, then run along the south shore of Cass Lake (north of Orchard Lake) on their way to South Lyon. However, this route cut through a 200-acre farm owned by David Ward, a wealthy entrepreneur who made his fortune in the timber industry. He did not want the rail line on his property and made his feelings known. To accomodate Ward, the line was changed to run between Orchard Lake and Pine Lake. 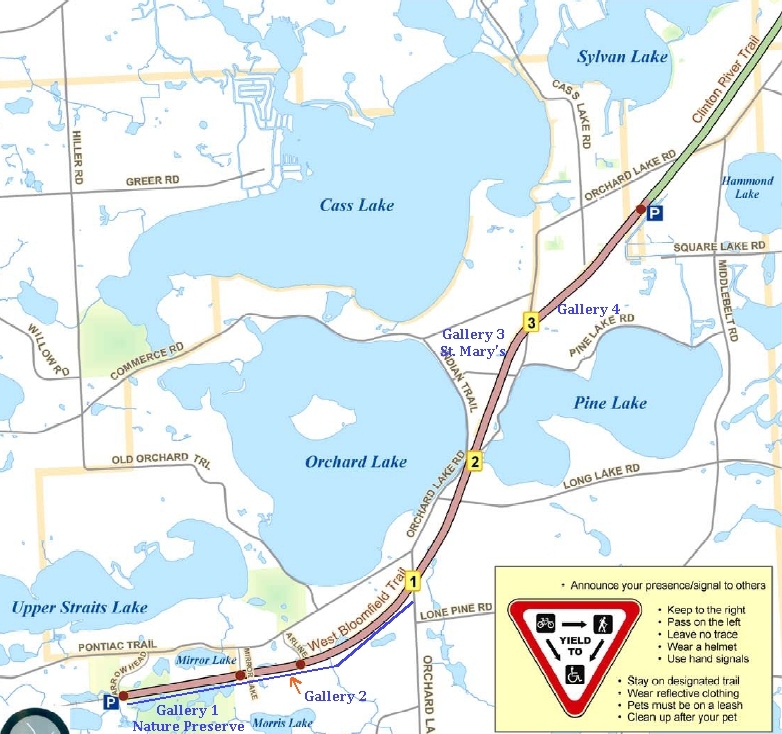 As a result, the tracks formed a large part of the boundary between Orchard Lake Village and West Bloomfield. During the mid 1800's, West Bloomfield largely consisted of wilderness and a few subsistence farms. This new rail line had its depot on Orchard Lake near the Michigan Military Academy. The new rail line became the chief thoroughfare for bringing students to the academy from Pontiac until it closed in 1909. Today, Orchard Lake St. Mary's has replaced the former Military Academy. During the late 1800's, a large hotel known as the Orchard Lake House and later as the Seeley Hotel, overlooked beautiful Orchard Lake. The trains brought vacationers to this hotel to spend the summer boating, fishing, and swimming. Then, in the 1890's, the rail line was acquired by the Grand Trunk Western Railroad. The Detroit Urban Railroad, and electric railroad running from Detroit the Orchard Lake Village and then to Pontiac, was also constructed, bringing people to the area who built summer homes. New roads and automobile increased the influx of people settling in the West Blooomfield. By the 1950's, Grand Trunk ended its passenger service and became a "freight only" railway. By this time, suburbs had begun to spring up throughout the West Bloomfield area and with them came more roads and large trucks that could carry freight. Trains had seen their heyday. The Detroit Urban Railway was long gone. The Grand Trunk was losing stream rapidly. In August of 1984, Grand Trunk abandoned this section of its railway and removed the tracks, leaving behind a rock-strewn path. 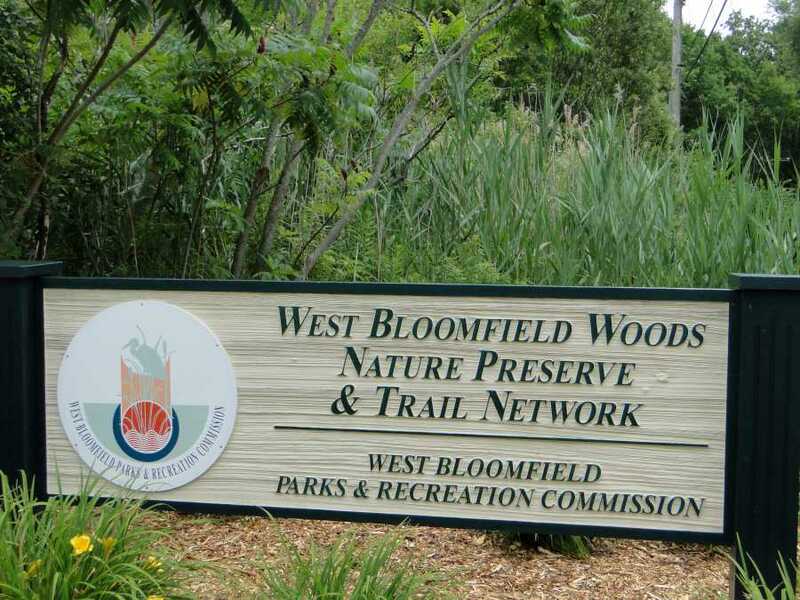 In 1987, West Bloomfield Parks and Recreation became part of the national Rails-to-Trails movement, and a charter member of the national Rails-to-Trails Convervancy. Using grant money from the Michigan Natural Resources Trust Fund, Parks and Recreation acquired this 4.25-mile piece of the Grand Trunk corridor in 1989. The trail was then developed and opened as a rail-trail conversation project for public use in 1993. At the height of Michigan's railroad era, more than 9,800 miles of railroad tracks criss-crossed Michigan. Today, railroads have abandoned most of those tracks, but increasingly, communities like West Bloomfield have converted their rails into linear greenways that provide recreation and relaxation. Like the railroads, they continue to connect communities.